A decade ago, a J.P. Morgan Chase executive stood up before a roomful of investors and appeared to commit career suicide. The manager, a retail banking head named Charlie Scharf, had bad news. Mortgages were imploding at a rate far worse than expected, especially among the bank’s $95 billion in home equity loans, Scharf told the audience in February 2008. Mea culpas came fast and hard: Scharf hadn’t anticipated how bad the housing downturn would be and didn’t act quickly enough as signs emerged, he said. But the episode showed Mayo that at J.P. Morgan, led by Jamie Dimon since 2005, managers owned their mistakes rather than sweeping them under a rug. The history of American finance is littered with examples of executives who delay recognizing errors until it’s too late, as the collapse of Lehman Brothers later that year attested to. Under Dimon’s watch, here was a lender that prized independent thought and taking responsibility for mistakes. Instead of getting fired, Scharf went on to spearhead J.P. Morgan’s acquisition of Washington Mutual’s banking units six months later. (He later became CEO of Visa and now runs Bank of New York Mellon.) That crisis-era takeover, along with that of Bear Stearns, helped create a juggernaut: A national bank with branches from coast-to-coast melded to a top Wall Street trading and advisory firm. 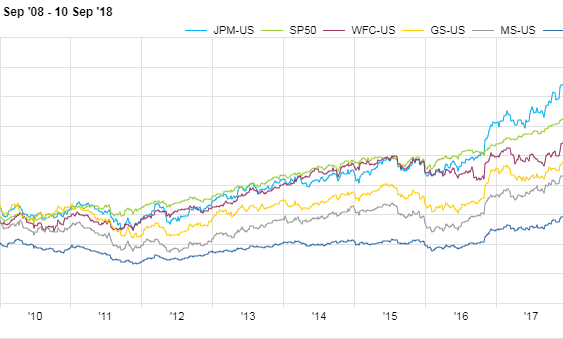 Nearly any way you look at it – stock performance, revenue, share in businesses from deposits to bond trading – Dimon, 62, has outdone his rivals among big U.S. banks. In the decade since that seismic, once-in-a generation upheaval, Dimon has pressed his advantages, winning a top market share in most businesses he competes in and plowing billions of dollars into technology. From millennials with a few dollars in savings to trillion-dollar technology companies – and everyone in between – J.P. Morgan wants to bank them. That has helped J.P. Morgan leapfrog competitors from China and the U.K. in the total value of its stock. Dimon’s bank is now the world’s most valuable by market capitalization at $383 billion. The firm produced an industry-best $24.4 billion in profit last year. Still, banking – taking money from depositors and lending it out to people and corporations – is not what you would call a growth industry. And a new threat is on the horizon: Banks are now preparing for tech giants like Amazon and Google to intrude on their turf in areas from deposits to payments. But the biggest question around J.P. Morgan is the obvious one whenever a leader has had an outsized impact. What happens when he leaves? Dimon plans on retiring in about five years, he said in January. Companies whose influential leaders step down typically underperform the market for at least a year, according to an Aug. 6 Morgan Stanley note. Dimon has delivered annualized returns that are two percentage points higher than the S&P 500 during his tenure, and investors wonder if his potential successors can deliver the same growth, according to the note. Perhaps some of Dimon’s risk-managing DNA will remain in the bank’s culture and processes. For instance, the firm performs more than 100 stress tests a week, measuring the impact from possible wars, geopolitical disasters and recessions.